The whole Arab world contributes less than 1% to the global expenditure on research and development. 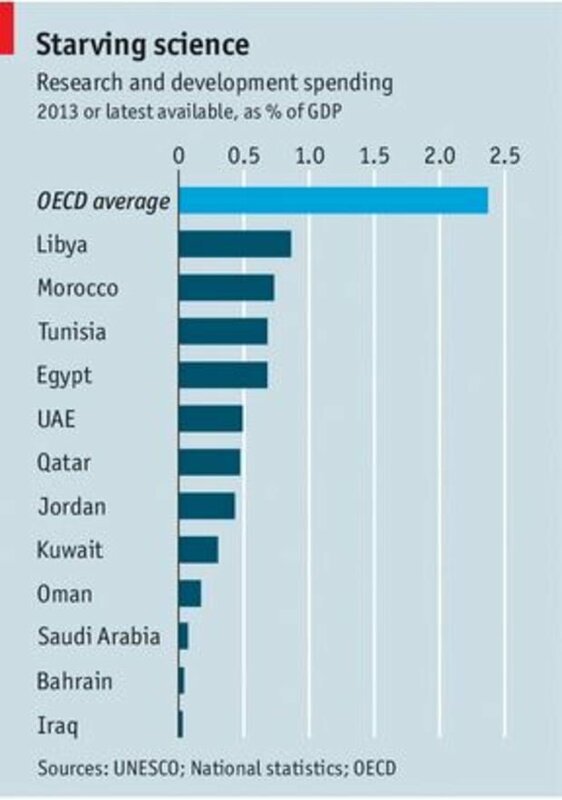 Egypt spends 0.7% on research and development coming 4th in the region after Libya, Morocco and Tunisia according to UNESCO. While the whole Arab region contributes less than 1% of the total global expenditure on research and development. Both the government and the private sector are not spending enough on scientific research, the parliament is trying to raise the budget allocation for health, education and scientific research combined to reach 10% of the budget. Statistics show that Egyptian scientists achieve more abroad than in their own country, Arab experts claimed this is due to the lack of an encouraging environment to pursue science and sufficient funds to complete projects. The Global Competitiveness Report (2015-2016) ranked Egypt at 111th place out of 140 in investment in skills and education and a shocking 139 out of 140 in quality of primary education. Educational experts stressed Egypt's need to allocate more funds to research and development and creating an environment that is supportive of science and innovation. This in turn will encourage business and investment. An educational system based on critical, analytical and scientific thinking is the way forward, giving up the mono-directional current system based on memorizing curriculum.